"He’s not going anywhere," an official told ABC News. A growing number of White House officials say they are growing more pessimistic that despite multiple ethics investigations, questions about his spending, and now accusations he used his official capacity attempting to secure a business venture for his spouse – embattled EPA Administrator Scott Pruitt has one thing he does not need to worry about – his job. Multiple senior administration officials who spoke to ABC News say the president does not appear to be changing his stance and is standing behind Pruitt. (Andrew Harnik/AP, FILE) Environmental Protection Agency Administrator Scott Pruitt testifies before a Senate Appropriations subcommittee on the Interior, Environment, and Related Agencies on budget on Capitol Hill in Washington, May 16, 2018. That official is referring to a new accusation that Pruitt had his office contact the CEO of fast-food giant Chick-Fil-A in an effort to secure a franchise for his wife, Marlyn. “My wife is an entrepreneur herself, I love, she loves, we love Chick-fil-A as a franchise of faith and it’s one of the best in the country and that's something we were very excited about,” Pruitt told WISC. Pruitt’s wife never got that franchise, as first reported by the Washington Post. The Office of Cabinet Affairs, a division of the executive office of the president that oversees all cabinet agencies, has held multiple meetings with Pruitt’s EPA leadership including meetings with Pruitt and his chief of staff, Ryan Jackson. “It’s up to the EPA at this point, they’ve been told what they can and cannot do so hopefully they just get it right,” another official said. The laundry list of accusations against Pruitt has been growing. Congressional committees have looked into costly flights including several first-class trips taken by the Administrator during his first year in office. Questions have also mounted about a sweetheart real estate deal Pruitt had for a Capitol Hill condo that is co-owned by the wife of a top lobbyist, who had business before the EPA. That lobbyist, J. Steven Hart, has since retired from his firm after the accusations came to light. Pruitt also came under fire for authorizing huge raises for two members of his team. 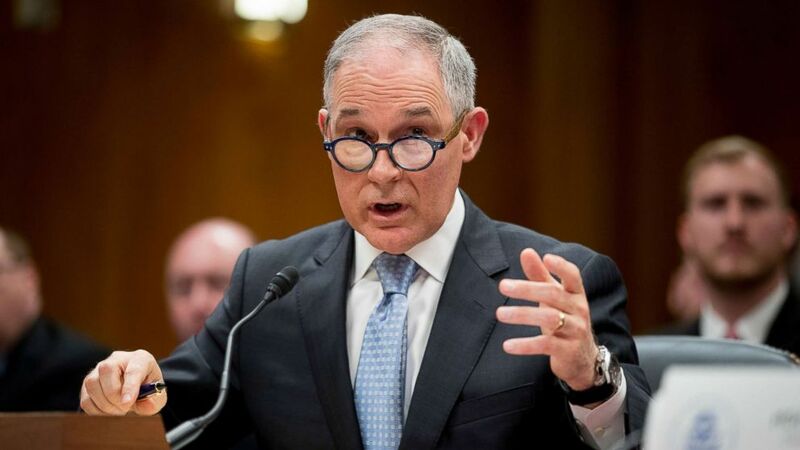 Sarah Greenwalt and Millan Hupp, longtime loyalists to Pruitt, both of whom received raises when Pruitt’s team used a loophole in the Safe Drinking Water Act to pay for the raises after they were first rejected by the White House. Hupp and Greenwalt resigned this week, the reasons for their departures is still unclear. Members of Congress have also called on Pruitt to step aside. Senate Joni Ernst (R-IA) joined a chorus saying earlier this week: “He is about as swampy as you get here in Washington, D.C. And, if the President wants to drain the swamp he needs to take a look at his own cabinet. Yet just Wednesday, one Republican was there to defend Pruitt.